I am currently a television host of a culinary series, Butter + Brown, writer/blogger for The Hautemommie and an entrepreneur. I own an apparel line that caters to HBCU students, alumni and supporters called Sweet Knowledge Clothing. How do you keep track of what you’ve done? I don’t think I do, which is why I probably think I haven’t done enough. I haven’t stopped to think about all I have accomplished thus far. In a recent interview, you mentioned you wanted your daughters “to see that they can do it all.” How do you manage everything? My mom and husband. Plus people I work with being supportive of me and my goals. I’m not an island. What do you do to recharge yourself? Ha! I don’t have time for that. So the basics: go to bed at night. How many hours of sleep do you get (on average)? Do you have a morning ritual or routine? If so, what is it? No, and I need one. A small human currently runs me, so I do whatever she tells me. What has been your biggest disappointment in life, and how did you handle it? My degree not saying Howard University. I have one, but it doesn’t encompass my experience. I handle it by not thinking about it too much, but I have to admit it still stings. What is your most significant accomplishment? Is there anything you hope to do even greater? Using Let Leslie Tell It as a jumpstart to my career and taking the chance on myself to even do the show. I hope to continue to make my dreams a reality. What are your favorite apps/tools that help you do what you do? Probably my husband because he questions me, encourages me, hypes me up and trolls me LOL. He makes a difference in how I choose to do things. At a BBQ at some strangers’ home that neither of us knew well. It was destined; I genuinely believe that. What does it mean to allow another person to love you truly? To be vulnerable with them; letting someone see you broken is when you trust them with your life. What do you feel your impact is on those around you? What would you like it to be? You know I wonder this often, but I say aloud the things others think because I’m unafraid of what people will think of me. I’m comfortable in my skin, and I think that inspires others. I’d like my story to show people going through a difficult time is not the blueprint of your life. You can make things change. The usual: my family, stability, etc. But also my peace of mind and the ability to share my story because I’ve been able to work through my trials. The Word of God inspires me; I find that little nuggets of the word come to me in different ways, and I’m reminded of how far my faith has brought me. 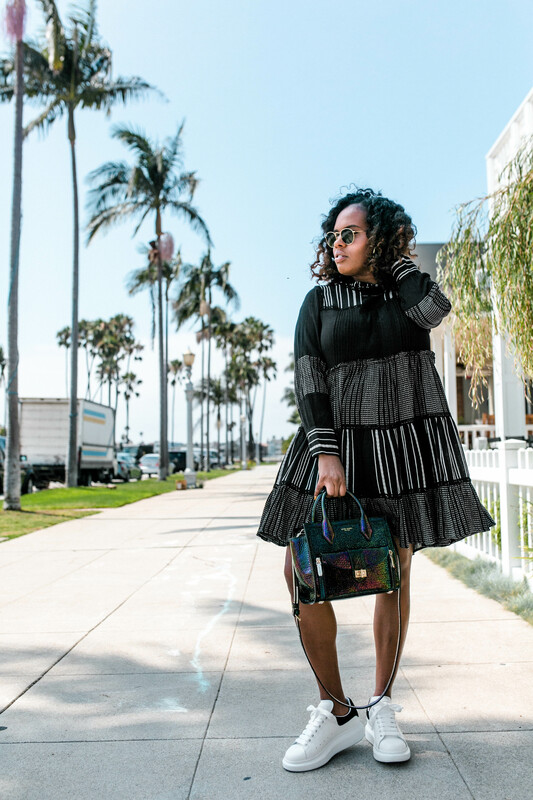 As far as people go, my girl Issa, how she’s been able to make a mark on the world on her terms; Tracee Ellis Ross’ style inspires me along with various bloggers/content creators: Asiyami Gold, Joekenneth, Elaine Welteroth, to name a few. Who is your favorite person to follow on social media? Can’t pin it to one, so here are a couple: my longtime friend (and co-founder of The Sunday Share) @FirstGentleman and my girl @ChefResha; these two for laughs/good convo starters and @GeeDee215 for politically driven chats. I’m quieter and more anxious than people assume. Currently the state of the United States, but I know it’ll all be okay. What do you want more/less of in your life? Wealth, it will enable me to change the world in the ways I want to. Physically? My legs. Non-physical: my drive. Have you achieved your life’s goals? If not yet, what are you doing to accomplish them? Working on it; I think our goals change as we achieve them. One was to get my show picked up for TV, and I did. So while I have accomplished some things, others are still in progress. What piece of literature has influenced you the most? A book called A Separate Peace stuck with me as a youth; it made me want to write for television. Summer Sisters by Judy Blume is the book that made me want to write a great American novel. What are you currently reading or is the last book you read? I love good young adult novels. I’m currently reading a book called Illuminae. The last book I read was another young adult novel; I love them. What is the most exciting thing you’ve read online recently? It was a story about a writing group on Facebook started by a black girl! I want to join, but I can’t locate the article. In conversation do you tend to talk or listen more? Depends on who I’m talking to, but I think I can say I listen as much as I speak. What are you looking for when you have a conversation with someone? What topics do you want to discuss? Usually, something that isn’t small talk. I want depth and realness. Let’s talk about race, life, love, books, hopes and dreams. If you were guaranteed honest answers to two questions, what would you ask and to whom? “Did you ever love me?” to someone I loved. “Did I make the right choice?” to God. Is there something that you’ve dreamed of doing for a while? If so, what is it and why haven’t you? Getting into voice acting; primarily because I’m not sure where to begin or who to ask. When is the last time you cried and why? A few weeks ago; I was tired, overwhelmed and offended. Home. Washington, D.C. or Los Angeles — both of those places give me solace. If you could take a one-month trip anywhere in the world, all expenses paid, where would you go and what would you do? Paris. I’d write, explore, eat, take cooking classes, shop vintage Chanel, take quick trips to Spain, London and Morocco while I’m there. Do you have a favorite restaurant? If so, what is it? My mommy’s sweet potato casserole. What is your favorite food to prepare? Baking cakes. The process of it all is relaxing. Any particular kind of cake? No, but typically white, carrot, coconut, chocolate by request. What is a song, album or playlist that everyone should hear? Whew! Hozier’s self-titled debut album is so rich and flawless; I go back to it time and time again. Jacob Banks’ “Chainsmoking” is a work of art. And Some x Y is dropping hits one by one. A life devoid of worry. What is the greatest lesson you’ve learned? Your mother is right about most people. Ask for help sooner. Don’t try to move away from who you’ve always been because you feel like you missed out on something. Do you have a mantra or quote that guides your life? My peace is my priority. Be faithful over little, God will make you faithful over much. MYOB – mind your own business. As someone who brought joy to others, cared for them, was a great mother, an honorable friend, inspired people to be better, making people laugh. Who would you like to answer these questions? Follow her on Facebook, Instagram and Twitter.